There are two branches in this drawing that just bug me. When one or two elements that aren’t part of the focal point of the carving grab all the attention, then they just have to go. The picture above is the lower half of the second tree in my latest project. It’s the one that will be in the back layer and is supposed to add complexity and interest, but not be the focal point. As a standalone drawing it looked great. 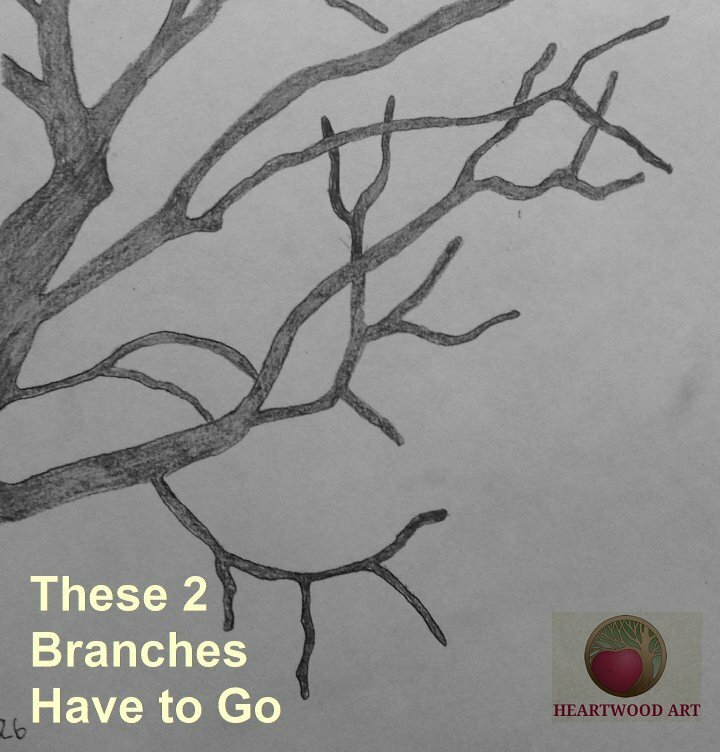 But when I placed it with the first tree on my light table, all of a sudden the lowest branch jumped out and grabbed my entire attention. As much as I tried not to look at it, I found my eyes being drawn back to that area of the carving. I suppose it’s like trying not to laugh in church. The more I tried to ignore it, the worse it stood out. My first instinct was to remove that odd little branch at the very bottom. But then, since there was no other true focal point in the rest of the drawing, it actually added an element of interest. It was something odd. And if it’s odd, I generally like it. But this was too odd. It didn’t really add interest. It grabbed all the attention for itself. But it didn’t have to go entirely. There needed to be a branch there. Too big a hole was left when I erased it. So, I drew in another branch, but one with less attention-hogging, eye-grabbing crooks and turns. Once that was fixed, the forked branch above the big limb took its place as the attention getter. It started looking like an old witch’s boney fingers. Well, that won’t do. The trees may be bare, but I don’t intend for them to be scary. So, it had to go too. And again, it left too big a hole when erased, so I drew in a less interesting forked branch. I’ll need to stare at this new drawing in context of the whole for a few more days before I call it aesthetically finished. And then I’ll begin looking at it from a cutting perspective with consideration for where the drill holes and scroll saw blade will have to enter and turn. Unlike my single-ply carvings, I don’t have to examine it for strength, since this will be in plywood. I’m one step closer to cutting, if the two new branches meet muster over the next few days.